I'm pretty sure I saw one of these driving on the street the other day, but I can't be sure because I passed it like it was standing still in a soccer mom minivan because...well..yeah...these things are slow. Anyway, find this 1991 Mitsubishi Delica Star Wagon offered for $6,500 in Albuquerque, NM via craigslist. Tip from Rock On! 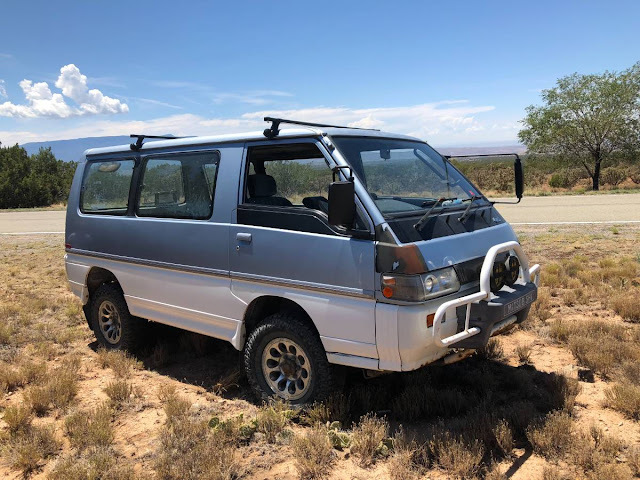 Selling a very nice 1991 Mitsubishi Delica Starwagon with 4 wheel drive (3 speed transfer case with 2hi, 4hi, and 4lo), 2.5L turbo Diesel engine, and automatic transmission. 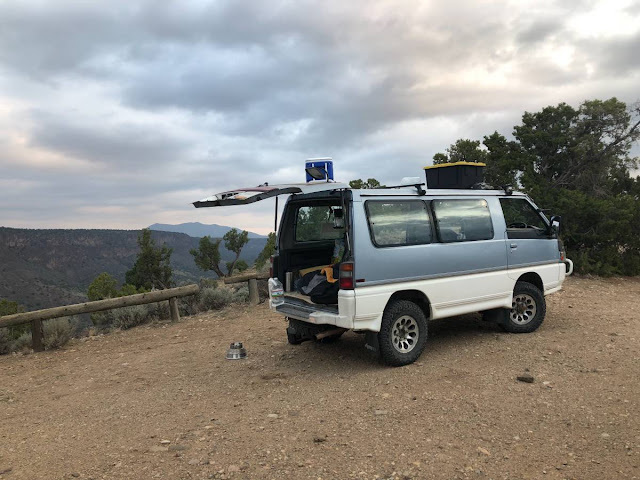 This is the ultimate go-anywhere, expedition ready camping rig. It was originally from Japan, so it is right hand drive (but easy to get used to since it has an automatic transmission), and then imported to Canada where it spent some time in British Columbia, and is now here. Being a 1991 model it is legal in the US and only requires some EPA and NHTSA exemption paperwork. It has around 227000-ish kilometers, which converts to about 141,000 miles. It has a new cylinder head from Germany that was installed last year, along with new timing and accessory belts and new thermostat. It does have an internal engine problem still, hence the low price (these usually sell in the $10,000 to $20,000 range). 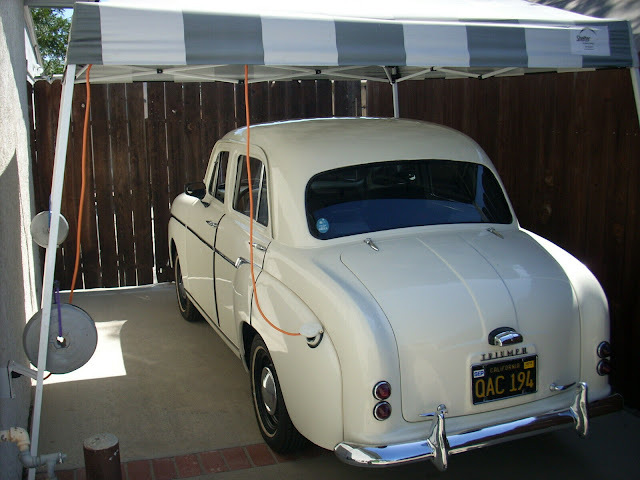 It starts, runs, and drives great, but when it is cold it misfires on cylinder 4. The problem is the piston rings on cylinder 4 causing low compression until the engine warms up. When it first came to the US it had a failure of the exhaust valve on cylinder 4-hence the requirement for a new cylinder head. Unfortunately when the head was replaced I took a chance that cylinder 4 was okay, even though the piston had gotten a little dinged up. But not replacing the rings and pistons at that time turned out to be a bad decision. I have a full set of brand new pistons and rings to install in the engine, so if you're a mechanic or want to turn some wrenches on an easy to work on project here is an opportunity to get a great deal. The engine is under the front seats, like on the older Toyota Van wagons from the late 80s and early 90s, and it is easy to access. Also included is a brand new water pump to get the van all in tip top motoring shape. These are amazing vans to drive on road and off road. This returns about 20 to 25 mpg and can be run on waste vegetable oil. Check out YouTube for some amazing videos of their off-road capabilities. These have an international fan base and are used as expedition rigs all over the world. British Columbia is full of these things, and most do not need a new engine. I think he (or she) might have invested a little more time in presenting the expedition camper possibility. What they showed makes me think more of an alternative to a homeless shelter. And @BearMtnMartin is right that there are a fair number of these up here in Canada, and usually in quite nice condition. With the $Cdn currently being in the dumps, I imagine there are deals for Americans. Importing a qualifying vehicle from Canada to the US is not a huge challenge at all. Just some paperwork and some planning.